Sites.temple.edu will undergo scheduled maintenance on Tuesday, October 17th, 2017 from 6:00 PM to 7:00 PM. Plugins and themes will be updated. There may be intermittent access during this time. After the maintenance, Computer Services recommends that site administrators check their site to ensure the plugins and other features are still functioning properly. For more information please submit a help request to Computer Services. This entry was posted in Plugin Upgrade, Theme Upgrade on October 11, 2017 by Stephen Guglielmo. Sites.temple.edu will undergo scheduled maintenance on Friday, September 29th, 2017 from 6:00 PM to 7:00 PM. WordPress core and PHP will be upgraded. No action is needed by site administrators. There may be intermittent access during this time. WordPress core and PHP will be updated to the latest version. This entry was posted in Core Upgrade on September 25, 2017 by Stephen Guglielmo. EDIT: The maintenance is complete. Sites.temple.edu will undergo scheduled maintenance on Tuesday, July 11th, 2017 from 6:00 PM to 6:30 PM. WordPress core, several plugins, and several themes will be upgraded. No action is needed by site administrators. There may be intermittent access during this time. WordPress Core will be updated to version 4.8. Read more about WordPress version 4.8. This entry was posted in Core Upgrade, Plugin Upgrade, Theme Upgrade on July 10, 2017 by Stephen Guglielmo. EDIT: Maintenance has been completed! Sites.temple.edu will undergo scheduled maintenance on Wednesday, May 24th, 2017 from 6:00 PM to 6:30 PM. WordPress core, several plugins, and several themes will be upgraded. All upgrades are minor. No action is needed by site administrators. There may be intermittent access during this time. This entry was posted in Core Upgrade, Plugin Upgrade, Theme Upgrade on May 18, 2017 by Stephen Guglielmo. Computer Services will be updating the Gallery theme on Sites.temple.edu on Wednesday, May 17 from 6:00 to 6:30 pm. When the change is made, the Gallery theme will revert to the default settings. Your content will carry over, but any changes you made to the theme’s appearance will not carry over to the new version. Once the theme is updated on Sites.temple.edu, you will need to manually redo any changes to the theme’s appearance that you want to keep. Users who have sites using the Gallery theme have been notified and given additional instructions via email. For more information on the Gallery theme, see the UpThemes Gallery Knowledge Base. Thank you for your cooperation and working with us on the upgrade. If you have any questions, please contact the Help Desk through the TUhelp website or call 215-204-8000. This entry was posted in Theme Upgrade on May 17, 2017 by Stephen Guglielmo. Please close your browser after logging out of Temple Sites to ensure your information is safe. For security reasons, it is important to actually log off when you’re done so others can’t open the browser and get into your accounts. If you have any questions, please open a TUHelp request. This entry was posted in Announcements on April 20, 2017 by Stephen Guglielmo. On Thursday, April 20th from 6:00 to 7:00 PM, Temple University Sites will be switched to a new login screen. 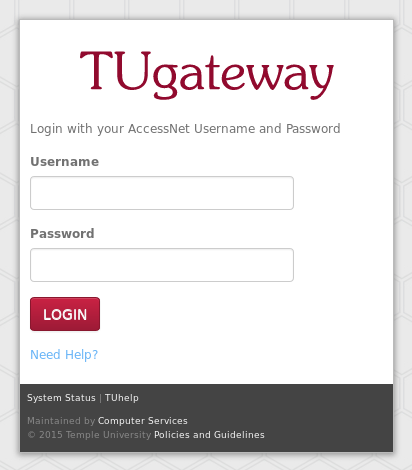 After the change is made, you will log in using the TUgateway screen. Please continue to use your AccessNet username and password to log in. Screenshot of the TUgateway login page. As usual, please open a TUHelp ticket if you have any questions or concerns regarding the new login system. This entry was posted in Announcements on April 4, 2017 by Stephen Guglielmo. Sites.temple.edu will undergo scheduled maintenance on Wednesday, March 22nd, 2017 from 6 PM to 6:30 PM. WordPress core will be upgraded to the latest version. There may be brief intermittent access during this time. This entry was posted in Core Upgrade on March 15, 2017 by Stephen Guglielmo. Sites.temple.edu will undergo scheduled maintenance on Tuesday, February 21st, 2017 from 6 PM to 7 PM. Several plugins will be upgraded. All upgrades are minor. There may be brief intermittent access during this time. This entry was posted in Plugin Upgrade on February 16, 2017 by Stephen Guglielmo. Sites.temple.edu will undergo scheduled maintenance on Friday, February 3rd, 2017 from 6 PM to 7 PM. WordPress core and several plugins will be upgraded. All upgrades are minor. There may be intermittent access during this time. This entry was posted in Core Upgrade, Plugin Upgrade on February 2, 2017 by Stephen Guglielmo.